A collection of installation projects and environmental design. There are many things that are hard about working for a company that's growing very, very quickly. But one thing that's amazing is the consistent need for office installations and solutions, to keep new spaces feeling on brand. I finagled my way into being the go-to brand designer for environmental design projects very early in my time at Pinterest and held onto it tightly! It wasn't all fancy meetings with architects, hiring artists, or hand-creating sculptures — to really earn my keep in this role, I also worked hard on the nitty gritty stuff like conference room naming and signage, wayfinding, keeping the landlords happy, etc. But I'll just focus on the fun stuff here! Pinterest’s flagship sales office in NYC needed an eye-catching entryway piece worthy of the space. We made an installation of “paper Pins” with photographs and information that coincided with the block of Manhattan on the map. Overall design and concept were my own. Steph Goralnick took all custom photographs (that were reused for several NYC ad events), as well as doing heavy lifting with captions and production design. The Pinterest Workplace team also worked hard on taking the installation from production documents to reality. Sign Expo in Tribeca did the fabrication and installation work. Magnetic letters allowed for the welcome message to change. Budgets were generally tight for office installations, but it led to some delightfully scrappy solutions like the lantern sculpture below (which I physically made with fishing line and a scissor lift and a few friends for only $250). Pinterest CEO Ben Silbermann commented the following on an Instagram shot of it: "I love it. One of my favorite parts of our office!" 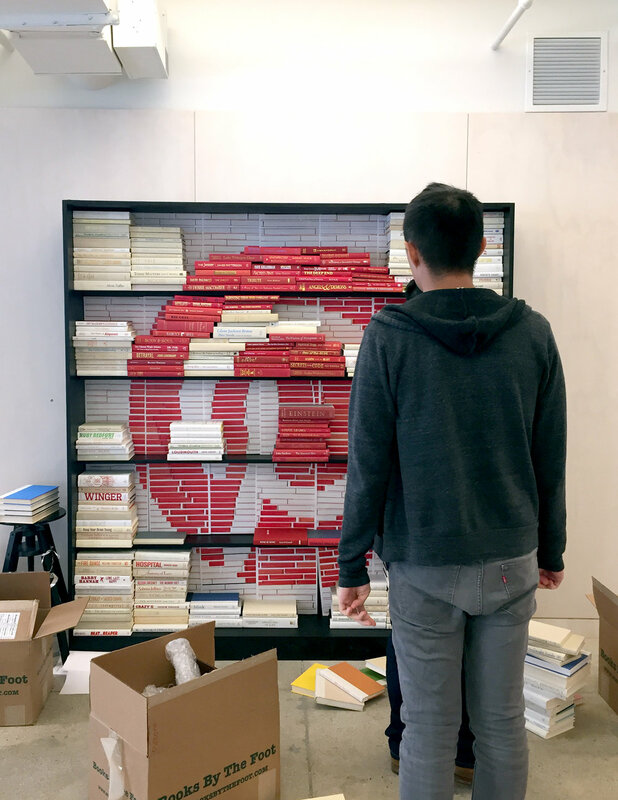 Pinterest's New York office is on Library Way across from the New York Public Library so it seemed only fitting to create a giant Pinterest logo out of books. I planned, designed, and helped coordinate the installation (with construction advice from installer Jon Stevens) and helped the office build it as a group project they could all feel ownership of. Through a miscommunication with the finance team, we believed we had zero dollars budget for the branding of this unfortunate entryway into a new engineering overflow building. I got creative with paint (already budgeted for) and created this simple solution that helped lead up the stair to the reception desk. Invitation for the LA event. Party in Austin at a BBQ joint. 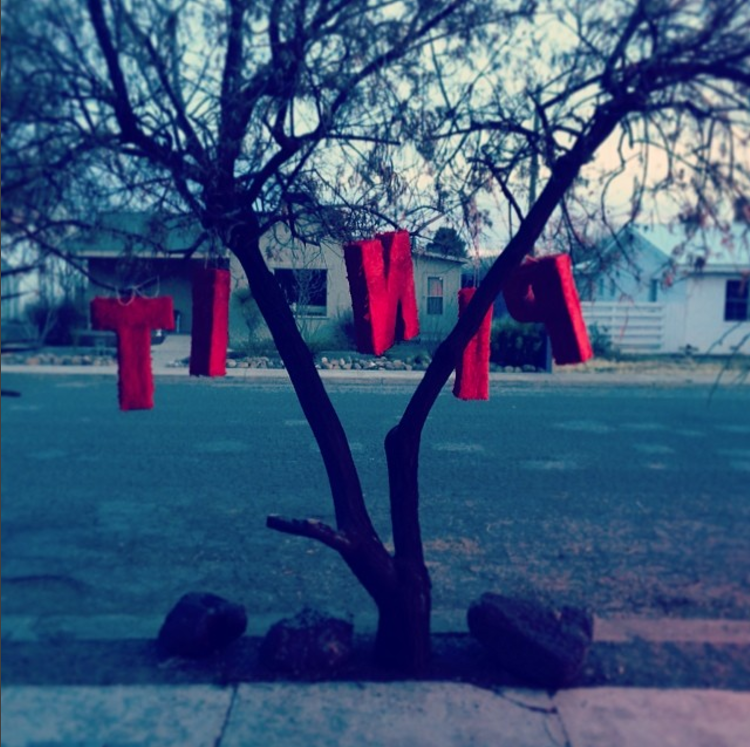 After the radio interview I set up in Marfa. Party in Los Angeles. People brought their promos and artwork to add to the board. The event got great coverage from local design bloggers. Guests at the Austin party could silkscreen t-shirts, totes, or posters with this graphic I designed. A photo of the creative team that I staged and shot at HQ. Next, read about when I helped create and design a conference for Pinterest.